One of my favorite book series as a child was Little House on the Prairie, written by Laura Ingalls Wilder about her family’s life in Wisconsin, Minnesota, Iowa and Kansas. Have you read it? Many of the scenes still play sharply in my mind, although it’s been at least 30 years since I last read the books. Clear snapshots of her sister, Mary, getting on the train to attend a school for the blind. Laura’s Pa looking out over the expanse of hills lying underneath wide-open blue skies of the Great Plains and wondering what lay just beyond. The proposal from Almanzo and the garnet and pearl engagement ring he gave her. "The cloud was hailing grasshoppers. Their bodies hid the sun and made darkness. Their thin, large wings gleamed and glittered. and the house with the noise of a hailstorm." Reading accounts about swarms of locusts, it’s easy to see why ancient people viewed them as plagues sent from heaven. One account, from 1875 in the western United States, measured a swarm that was 1800 miles long and 110 miles wide - almost large enough to cover the entire states of Wyoming and Colorado. An estimated ten billion insects blocked out the sun for five days. When locusts arrive, they aren’t welcome visitors at the table. They like to eat. A Lot. Greens. Grains. Cotton. Wool right off a sheep’s back. Even a very small part of an average swarm eats the same amount in one day as 2500 people. They destroy farms and agriculture in hours. Last week a plague of locusts swarmed Egypt and Israel, three weeks before Passover, recalling the biblical tale of the Exodus where locusts were one of the 10 plagues that descended upon Pharaoh and his people. No surprise that locusts are used as a metaphor for destruction and greed. But the thing about locusts is - they start out fairly benign. Like someone we might invite over to dinner, as long as we were clear about the table rules ahead of time. They are a type of grasshopper. And, as long as the grasshoppers are not crowded, or not affected by environmental stress like extreme heat or draught, they hang around in manageable groups and eat their fair share. But a scarcity of water or food causes them to aggregate together. And as they get pushed closer and closer to each other, their bodies change. Their wings grow longer. Their bodies darken. They prefer eating over anything else. And a locust mob is born. This sounds like reports of “Black Friday” sales after Thanksgiving, where people leave behind grace and civility and become crazed shoppers in search of the best price on the “it” product to buy that season. And when I think about climate change. And the increasing number of people on our planet. And the ever increasing resources we gobble up. I wonder if we sometimes act more like locusts than we realize. I’m reminded of unending wars. Reluctance to provide a safety net for the more vulnerable among us. A corporate business ethic that rewards profits over people. And we could stay there, in that line of thought. Except ... that’s not the whole story of us. Of humans. One of the most important messages of liberal religion is each of us has a spark of the divine within us. We have the power and ability to be good and do good in the world. Yes, we have within us a certain drive to be selfish and take more than we need. Put a piece of chocolate cake in front of me, and ask me to share, and you’ll see my dilemma pretty clearly. But we also carry an inherent drive to be in community. And we make choices in life, and it is possible for us to be shaped and encouraged by positive environments and people around us. Tom Owen-Towle, a minister and theologian in our tradition, who served this congregation for a brief time, tells a story about asking congregants to name their highest ideal for Unitarian Universalist character development. Justice, trust, acceptance, joy, courage, humility all make the list. But there’s one that Owen-Towle says matters most to religious living, without which we cannot sustain a path toward the Beloved Community, which we covenant to become each week in our Unison Affirmation. Generosity! You’ve been paying attention to our worship theme this month. Generosity undergirds the whole of our religious community. “Without generosity, one loves sparingly. Without generosity, our acts of justice rarely happen. Without generosity, we hoard our precious gifts” of time, talent and treasure. The honeybee is considered sacred in many parts of the world. Some stories say a honeybee planted the first seed that became a human. In Egyptian mythology, when the sun god Ra cried, as his tears fell onto the desert sand they became bees. Honeybees signify immortality and resurrection, diligence and hard effort. The honeybee epitomizes generosity. Bees have a complex and clearly-ordered system of organization, and share a collective intelligence. They fly up to 8 miles from their hive to gather pollen and nectar. And when a bee finds a treasure trove of tasty flowers, she doesn’t stockpile all the good stuff for herself. She zooms back to the hive and does a waggle dance for her sisters that tells them the exact location of the bounty of flowers! Bees work hard. Their goal is the common good of the whole. They pay attention to each other. Bees are on the top of my list of insects to invite to dinner, in part because they’d bring such a lovely hostess gift - honey! Here in the United States, we certainly have enough to worry about. But we don’t need to agonize about a swarm of locusts enjoying a mid-afternoon snack in our church garden. The last Rocky Mountain locust sighting occurred in 1902. Laura Ingalls Wilder’s family, and others like her, eventually destroyed all the habitat they needed to survive. If we aren’t careful, it’s possible honeybees could end up like the locust. A distant memory. Eradicated due to too many pesticides. Too many monoculture crops. Too much selective commercial breeding. Yet honeybees still buzz along in our gardens, doing the work of pollinating our fruit trees, vegetables, and herbs. Still they evoke feelings of wonder, awe, curiosity, and the occasional Ouch! when we step in their way. 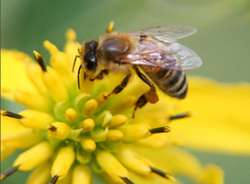 My friends, religious life calls us to emulate the honeybee and practice the art of generosity. With our earth. With our neighbors. And with ourselves. The next time a friend or co-workers asks if you are a church goer, I want you to say no. I want you to reply with pride: I am a church GIVer. I want you to understand yourself as a steward of this place. Of the physical space. Of the religious tradition we love and sometimes chafe against. Of each other. Of the surrounding community. I want you to give to Throop Church until it feels good. Until your heart and soul expand to the point you want to shout out an exhilarated YES to life and love. This month, Xina Kingshill and I will ask to make an appointment to talk with you in person. We want to hear what you love about Throop. What gifts do you already bring and what else of yourself do you want to share? What is your vision and hope for the future? And then we will ask you to pledge financially to help our collective YES become a reality. I am excited about our ministry together. I feel an upsurge in hope and commitment and creativity, and I increased my own pledge this year so next year we can extend our reach further. Now is the time to bring your gifts of love and service to the altar of humanity. Our message that all are loved and all people matter is needed more than ever. It is a blessing to be here together. Amen. Wilder, Laura Ingalls. On the Banks of Plum Creek. Lockwood, Jeffrey. “Death of the Super Hopper,” in High Country News. Accessed at http://wiki.answers.com/Q/How_much_food_can_a_desert_locust_eat on March 8, 2013.